By Alastair Lee BitsoiOn most Saturdays, Cameron Benally drives around the Phoenix metro area to fabric stores and finds prints he will use to customize baseball caps and T-shirts for his line of street wear called Profound Product. He looks for animal prints, tribal designs and other various cultural styles currently trending in the fashion world. After handcrafting his creations with his mother's sewing machine, he posts his apparel on social media sites like Facebook and Instagram, where he attracts most of his consumers. A quick glance at his Profound Product Instagram account shows a growing demand of pocket tees, tank tops and now baseball shirts, all designed with a custom pocket. 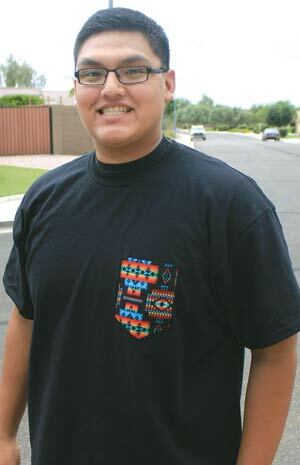 "I like creating a different style of clothing or create a different style to help people discover their own style," said the 19-year-old, whose Navajo roots are in the Four Corners region.Comment: For more on Navajo fashion, see Navajo T-Shirts Make a Statement and Paul Frank Announces Native Collaboration.